In the late afternoon of 4 August 1940, Polish pilot Witold Urbanowicz arrived by car in front of the officers’ mess in Tangmere, Sussex. A uniformed chauffeur circled the vehicle, then opened the door on his side. Stepping out of the car, Urbanowicz scrutinized the target of his new posting. The mess building was sizeable, built in brick with white, centrally placed portico and tiled windows. Branches of red ivy were snaking along its walls. Abundant shrubs of pale-yellow roses framed the entrance to the house, spreading their sweet fragrance. In the distance, visible among the trees against the setting sun, were fighter aircraft – Hurricanes and Spitfires. 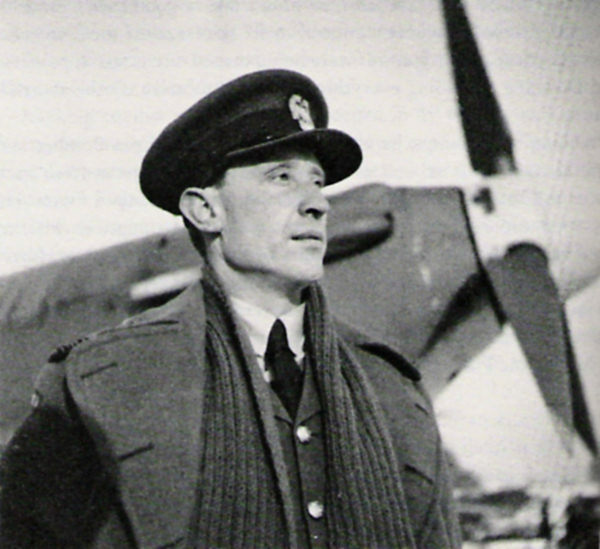 Urbanowicz was one of the first Polish pilots posted as reinforcements to the bleeding RAF fighter squadrons. Two of his peers from the same operational training course on Hurricanes also received postings: Stefan Witorzenc and Stan Skalski were both assigned to No. 501 Squadron. Urbanowicz was the only one to be posted to No. 145 stationed in Tangmere, a prewar RAF fighter station located close to the Channel coast. Inside, the mess made an impression of a cosy nest. From the spacious entrance vestibule, which welcomed the visitor with polished wooden floors and elaborate paintings, doors led to a dining room, a billiard room, anteroom and a lobby. The lobby, as if transferred from a gentlemen’s club, was panelled in polished oak and tastefully furnished with oriental carpets, paintings and green leather armchairs. After the chaos, dust and primitive conditions of France, many foreigners such as Urbanowicz found the comfort of a RAF’s permanent station rather overwhelming, on the verge of lash luxury. Officers were sitting around in the lobby, reading papers, smoking cigarettes. They were young, in their twenties, well dressed and sun-tanned. Some lifted their heads and greeted the newcomer silently: another replacement pilot. At 31, Urbanowicz was markedly older than any of them but also a highly experienced aviator. Back in prewar Poland, he had worked as a flying instructor at the Air Force fighter school in Deblin. His first aerial victory dated back to 1936, a Soviet reconnaissance aircraft that had crossed into Polish airspace. After Blitzkrieg in his country, Urbanowicz escaped, leading a group of fifty Air Force Officer Cadets to France via the Balkans. A lifelong anglophile, Urbanowicz decided early to continue fighting in Britain rather than France. He had social contacts in England, and anyway, his English was much better than his French. He was among the first Poles who arrived in Britain in January 1940, even though at that time there were no clear prospects for him to serve with the RAF as a fighter pilot. Now, all that was about to change. “A batman walked in behind me, carrying my luggage. ‘ I’ll show you to your room, Sir.’ he said. ‘Do you mind if I go first’? I’d rather have carried my own suitcase, but I knew from my stay at other airfields that it would be problematic. The orderlies were often elderly men, excelling in their trade. Now, when the whole country mobilised for the war effort, these gentlemen, who were too old to join the armed forces, wanted to serve their country at least as batmen, and so help to fight the Germans. If I had proposed that I would be carrying my bag, it would have hurt his pride. Many of the batmen serving at air stations were veterans of World War I, proudly carrying medals on their civilian jackets. Without talking, we took a broad staircase to the second floor, then walked along a corridor covered with red jute carpet. I received a room in the west end of the building, large, but sparsely furnished. At first glance, it became apparent that the old man was spending considerable time in keeping the room flawlessly clean. The floor was waxed, brass door knobs and window handles polished, bed made with clean linen. One of the armchairs in the room was occupied by a black, young setter with sad eyes. ‘Indeed Sir, that poor creature. Still waiting for his master to come home’. ‘Shot down this morning, Sir. I’m afraid he drowned, South of Portsmouth’. The dog, as if understanding, looked at us. Despite this harsh introduction to the terrible life expectancy of fighter pilots during the Battle, Urbanowicz managed to turn the bad luck of his predecessors. On 8 August, flying as a “weaver” behind the squadron’s formation, he prevailed his first meeting with German Bf 109’s, shooting down one of his opponents after an agonizingly long dogfight. That day, leader of the Blue section was lost; Urbanowicz was promoted in his place. A mere two weeks later, another promotion transferred him to No. 303 (Polish) Squadron, where he took command of the “A” Flight. Another fortnight later, he achieved the rank of Squadron Leader, replacing the first CO of the Polish unit, who was badly burnt in combat. During the Battle of Britain, Witold Urbanowicz claimed 15 confirmed victories and 1 probable, becoming the second highest-scoring Polish pilot of the Battle. Interesting points about the “batmen” and their pride in service as well as personal details like the dog waiting for his master to return from battle. These details help us understand the day to day life of the flyers.